Artist’s impression of the finished Tonsley advanced manufacturing precinct, adorned in solar panels. South Australia made headlines around the world when it was announced that the state had been powered by 100% renewable energy for an entire working day. Commentators took it as a proof that a fully renewable future is possible. South Australia, writes Jack Baldwin of the South Australian news service The Lead, demonstrates to the world the benefits of renewable energy. According to Baldwin, there are signs the rest of the country will follow, despite current anti-green government policies, and turn Australia from one of the highest per-capita emitters in the industrialised world to one of the lowest world. The South Australian renewable energy story started in 2009, with an announcement from Mike Rann, the state premier at the time, laying out the plan to turn South Australia into a clean energy hub for the eastern seaboard of Australia. On that date the government announced a target of 33 per cent renewables in South Australia by 2020. The state just about reached that goal in September of this year, six years ahead of schedule. Current premier, Jay Weatherill, increased the target to 50 per cent by 2025 – a goal some argue will be reached with government assistance or not. Nearly a quarter of houses in South Australia have installed rooftop solar panels, making it one of the highest penetration rates in the world. South Australia is an energy-blessed state. Olympic Dam in the outback north of the state is the biggest single deposit of uranium on earth – harboring 30 per cent of the world’s total resource – even though Australia has no nuclear energy facilities. Gas and oil are plentiful, and there’s low-grade coal to be found. But the land is also awash in solar and wind energy ready to be tamed. And it boasts potential in the novel applications of geothermal and wave energy. Its solar dominance started when the Rann government introduced feed-in tariffs and subsidies in 2008 for households installing panels and solar hot water systems. Combined with high energy costs – which according to the Australian Energy Market Operator (AEMO) were “largely driven by transmission and distribution network price increases” – it was the perfect storm for solar uptake in the state. The state government also funded large solar infrastructure works, including a 1 MW solar array on the roof of the historic Adelaide Showgrounds. The array is big enough to power some 200 homes. It was the largest rooftop photovoltaic (PV) array in the country at the time. It has more than 9,200 metres2 of panels and is more than five times larger than Australia’s next biggest at Melbourne’s Victoria Markets. The array is so large, in fact, that the Showgrounds are registered as a power station. Currently, rooftop PV accounts for 5.2 per cent of the state’s demand over the course of a year – 704 GWh per annum out of 12,855 GWh demand in 2013-2014. 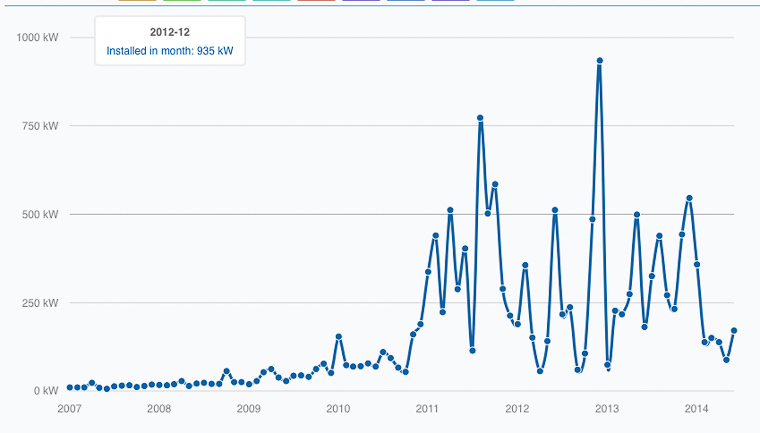 But solar’s output is far more impressive during peak hours. On average, some 13.7% of peak demand is met by solar, though that can reach up to a quarter on certain days. Solar contribution to the grid on 12th October. South Australia stands far above the rest of the country at over 25% solar energy during peak demand. Solar proves even more useful during South Australia’s summer heatwaves, when the grid is ill-equipped to meet demand from energy-eating air conditioners and failing infrastructure. In perhaps the biggest shift in the state’s energy outlook, solar scales up ahead of demand during these blazingly hot conditions, shifting and cutting peaks in the grid. The AEMO released a report after the January 13-17 2014 South Australian heatwave, which recorded the first ever five-day period above 42 °C, the hottest five-day maximum temperature on record, the hottest maximum five-day average temperature (at 43.6 °C) and the fourth hottest day measured in South Australia (45.1 °C). According to this report, solar greatly helped the network operator to cope with electricity demand on those days. 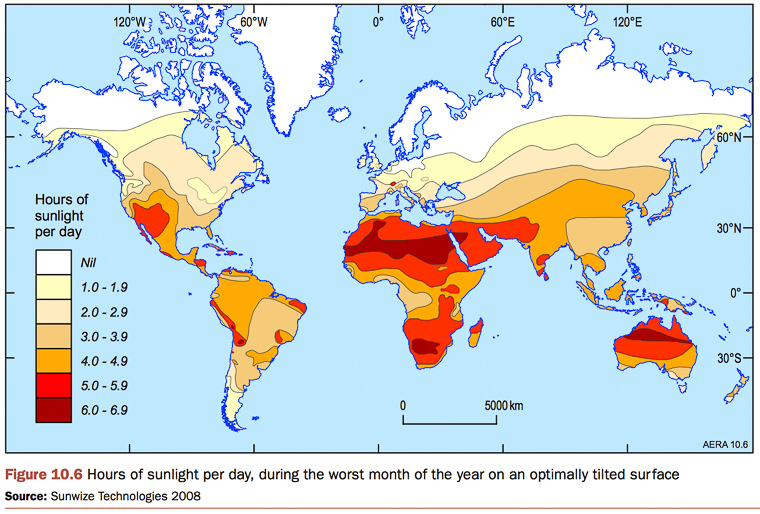 The blue represents demand during a 2009 heatwave, before solar was widespread. 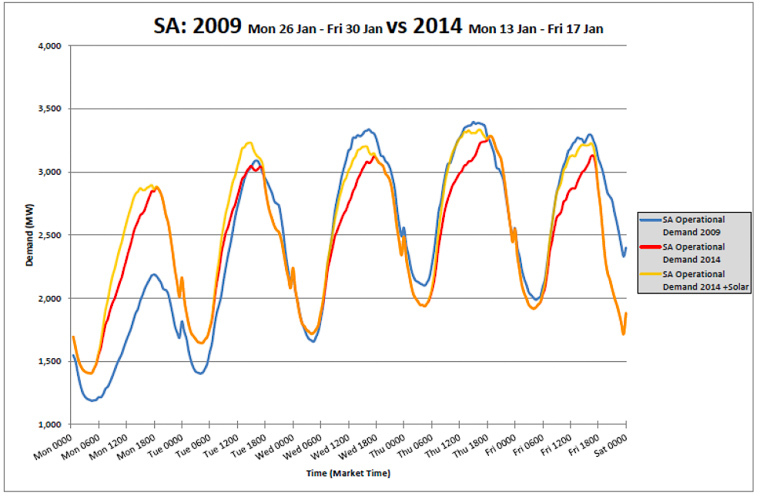 The red line represents demand during the 2014 heatwave. The gold line shows solar power ramping up and feeding in to the grid slightly ahead of the rise in demand in 2014 – pushing the peaks later in to the day and cutting their length. Spark Infrastructure, which owns SA Power Networks, agreed that rooftop PV reduced stress on the network and introduced stability to the grid during the heatwave. A decentralised network of power supply also means there’s some failsafe during extreme conditions. It turned out that many of the traditional power generators were in high-risk fire areas during the heatwave. This comes with a social payoff too. A lower risk of blackouts ensures that the state’s most vulnerable citizens during a heatwave, such as the elderly, are kept cool and healthy. The general social benefits of solar extend to low-income earners as well. Although it’s often said that solar feed-in tariffs represent a subsidy from the poor to the rich, in Australia the reverse is true. Low-income and rural populations are more likely to install panels than wealthier families, earning a degree of energy independence that buffers them from outside forces. The reason is probably that the relative importance of power bills is much higher in these households. Industries in South Australia have strongly taken to renewable energy – partly in thanks to the feed-in tariffs and payback that homes enjoyed but also for the green credentials that come with a strong environmental profile. That point runs especially true for agricultural food and produce exporters. ‘Premium Food and Wine from our Clean Environment’ is a South Australian tagline and one of the state’s priorities. 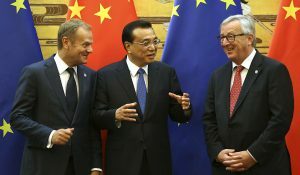 Export markets such as China and Europe are increasingly prepared to pay more for the benefit of sustainable, cleanly sourced food and products. For example, Jacob’s Creek Winery in the Barossa Valley have heavily invested in low-waste practice and renewable energy. Their visitor’s centre is flanked by two large solar arrays that produce all the energy the winery requires, selling the excess back in to the grid. Brett McKinnon, Global Operations Director at Pernod Ricard Winemakers, owners of Jacob’s Creek, said that the panels are part of their responsibility as a business. “Environment has always been a big focus for at the site. These particular solar panels have a 40% higher output than standard fixed panels – they have the capacity to generate an impressive 220kWh per day,” McKinnon said. “We’re a responsible business and have a commitment to minimising the impact we have on the environment we’re operating in. Whether it’s the solar panels used at the visitor centre, optimising our supply chain, or looking at our waste strategy, we’re constantly looking for new ways to optimise the way we work. One of the 80 kWh tracking arrays lining the road to the Jacob’s Creek visitor’s centre. South of Adelaide, Softfoot Alpacas are a leading light in the livestock trade and one of the state’s top export studs is also ahead of the curve on renewables. Gary and Sandy Retallick purchased their farmland in the late 1990s. It was in dreadful condition due to overgrazing by sheep. Having got into the alpaca game, Manager Ben Schmaal explains. Their operation – including the farm, their residence and a guest facility – now sources all of its energy from wind and solar, with a battery bank that stores enough energy for any downtime. Agriculture isn’t the only industry calling all in on renewable energy. One of the state’s largest industry infrastructure projects, the Tonsley advanced manufacturing precinct, is also becoming one of the greenest. Tonsley during early construction. The sawtooth roof will soon be covered in a massive solar panel array. Premier Jay Weatherill announced it would potentially become the largest solar installation in the state to date, putting out a tender for up to 25,000 square metres of solar panels to line the distinctive saw-tooth roof of the old plant. Built on the bones of the old Mitsubishi automotive plant, the Tonsley cluster is both a symbolic and literal revival of the state’s struggling manufacturing industry as a cleaner, smarter activity. The project’s green credentials expand beyond renewable energy. The Tonsley TAFE Sustainable Industries Education Centre won the Creative Re-Use Category at this year’s World Architecture Festival Awards in Singapore for reusing 90% of the original steel structure. ZEN Energy Systems are one of Tonsley’s first major tenants. The solar installer and tech company recently received a $200,000 grant to ease their move in to the facilities. Richard Turner, CEO of ZEN, says that the potential for industry to collaborate with educational institutions is unprecedented. The solar sector is a major growth area in the state. Suntrix, a South Australian owned and operated solar installation company, was recently named one of the country’s fastest growing companies by Business Review Weekly. Managing Director Jenny Paradiso believes that the residential market is becoming a tougher sell for solar installers, but there’s still plenty of potential in commercial and utility scale solar. “I wouldn’t say solar has reached its saturation point. But all of the easy-pickings, so to say, are gone. We’re still selling residential. In regards to the solar industry, residential is just such a small part of our business,” Paradiso said. Commercial is making up a larger portion of their business now, whether that’s the local fish and chip shop or a huge 100 KW installation. Many solar companies from the early days of feed-in tariffs have also gone out of business, and Suntrix finds work maintaining and servicing their panels. “The solar industry is going through rapid change, and we hope to see a long-term solution that respects the value that renewable energy brings,” Paradiso said, referring to the federal Renewable Energy Target. Tindo Solar are the only manufacturer of solar panels in Australia. They currently run a highly automated 60MW production line. Adrian Ferraretto, Managing Director of Tindo, believes that the ideological side of renewable energy certainly provides an incentive for potential customers – but it has to stack up financially too. South Australia is also the largest producer of wind energy in Australia. The state’s 1.5 GW of wind energy make up almost half of the country’s capability. Wind speed map of Australia. The darker blue indicates higher speeds and more potential for effective wind farms – much of South Australia’s south coast is well suited for it. It has changed the landscape of energy generation in the state. Of the two coal powered plants that were operating in South Australia, one has shut down and the other operates at reduced capacity for six months of the year. During the recent 100% renewable energy working days in South Australia, wind energy was responsible for generating the majority of the state’s power. As wind supply rose over the course of that week, the wholesale price of electricity fell. That observation is backed up by a study by the University of New South Wales that shows an inverse relationship between wind generation and energy price in South Australia. As the blue line – wind generation – picks up, the red line – energy cost – drops. Wholesale prices have been historically low – particularly so for regional areas – largely due to wind. The most recently completed major wind project is the $439 million Snowtown II, an array of 90 Siemens wind turbines of 3 MW each – for a total of 270 MW. They’re expected to pump out an annual output of 985 GWh. The Snowtown I array produced around 397 GWh of energy in 2013. That project is running at an incredibly high capacity – 42 per cent – and together with Snowtown II, they’ll make up some of the cheapest energy in Australia. It also holds the distinction of being the second largest wind project in the country. A (rough) map of the Ceres Project and the undersea cable that will run through the Gulf of St Vincent and in to Adelaide. The future of wind in the state is well and truly assured if the Ceres Project on the Yorke Peninsula goes ahead. The government has approved up to 197 wind turbines generating 600MW of power. 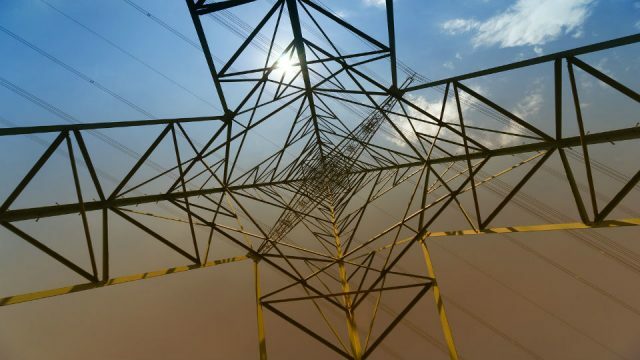 The $1.5 billion project would feed enough energy to power 225,000 homes through an underwater connection in to Adelaide’s power grid. 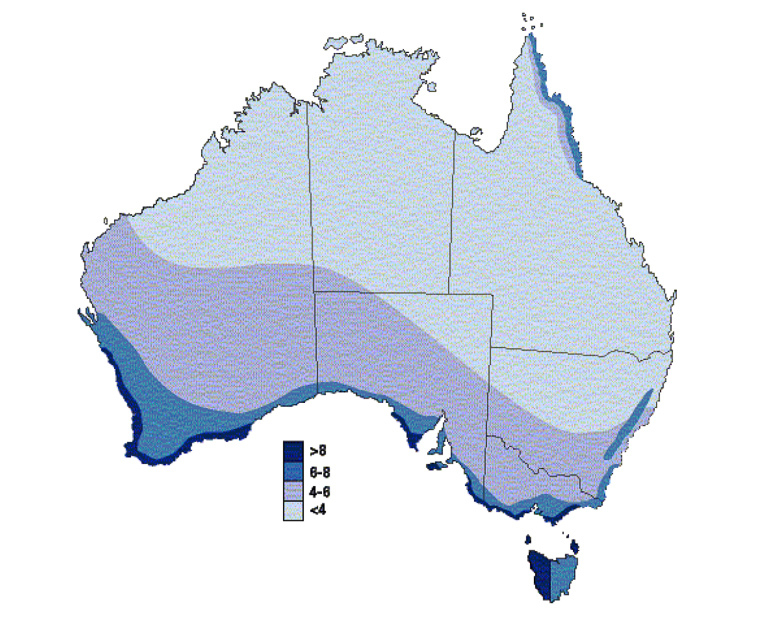 South Australia has been described as the country’s “hot rock haven”. A number of companies are exploring the potential of the state’s geothermal energy – mostly in the proof of concept phase. The renewable, emissions-free form of energy is created by digging wells in to deep granite systems. Geothermal energy avoids most criticisms that renewables attract, as it’s not reliant on intermittent wind or sun. It can provide steady, baseload power in to the grid. Geodynamics currently operates a number of pilot sites within the Cooper Basin in South Australia. Their claim lies over roughly 2,300 km2 of land, and includes some of the hottest known heat-producing granite rocks. Temperatures have been measured over 280°C at 4,900 metres. 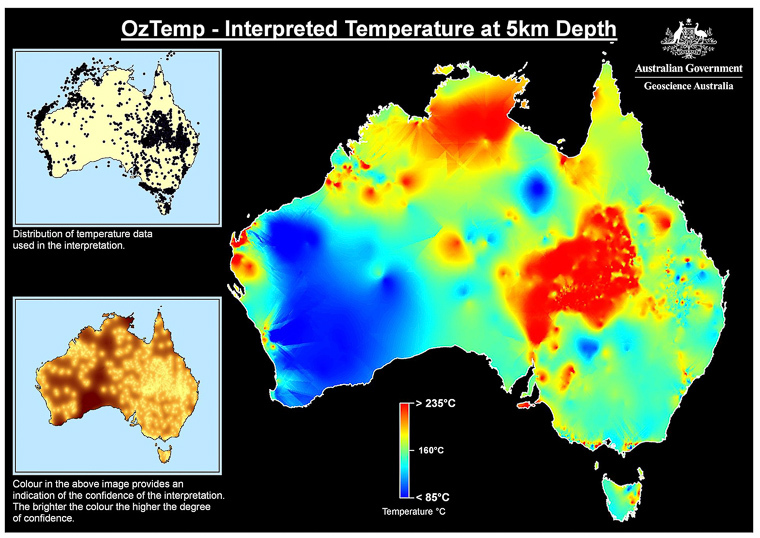 Geothermal map of Australia. The hot red centre is mostly the Cooper Basin – where companies like Geodynamics are drilling geothermal projects. The South Australian Centre for Geothermal Research was established at the University of Adelaide in 2010 as part of the state government’s Renewable Energy Fund. It received $3.6 million in funding to research and develop technology for the fast growing field. ZEN Energy are best known for their Freedom Powerbank battery system, which almost doubled the effectiveness of batteries through software alone. They’ve received significant funding to further develop their software and technology. CEO Richard Turner believes that home energy storage will change the way we live. “There is going to be a radical change. 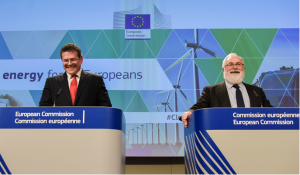 It’s like moving from mainframe computing to PCs all over again – we’re going from centralised energy generation and the grid to distributed energy generation and storage, where we generate and store and consume power where we need it,” he says. ZEN sees three markets: the consumer market for people who want to go off grid, or become grid-independent, the retailer market for companies like AGL and Origin, who will be selling less power in the future as people become more self-sufficient – but will pick up the slack by selling more hardware such as solar and storage systems, and the utility market, as a partner to optimise the grid. 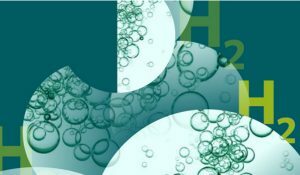 They’re not the only company at it: Tindo recently announced a collaboration with the University of South Australia to develop metal-air batteries which have the potential to increase capacity significantly. Old graphite mines on South Australia’s mineral-rich Eyre Peninsula are reopening, taking up the slack to provide resources to massive enterprises like Elon Musk’s giga-factory making the next generation of batteries for electric vehicles. South Australian mining companies such as Lincoln Minerals, Archer xploration and Valence Industries have claims on huge deposits of some of the world’s highest quality flake graphite. “This is a commodity breakthrough starting to have tsunami-like demand dynamics,” said Lincoln Minerals Managing Director Dr John Parker, about the rise of the electric car and demand for lithium-ion batteries, of which graphite is a crucial component. 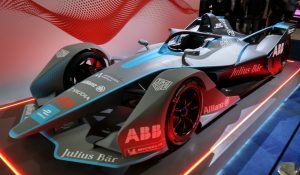 Valence Industries are also investing heavily in graphite and graphene – whether it’s research or processing facilities – with a view to pursue high value markets such as battery-grade graphite. If large scale enterprises like Tesla’s Nevada giga-factory succeed in pushing battery prices down for the electric car market, then technologies that South Australia already excels in, such as solar PV, will benefit from low storage costs and put further pressure on generators. South Australia’s renewable future seems bright, even if recent developments in federal policy have slowed investment in the sector. 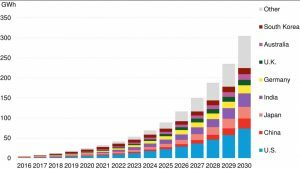 The transition to renewables is a necessary development as the economic giants of the world – the United States and China – increasingly move towards clean energy themselves. China has started imposing tariffs on dirty energy and coal imports as it declares as‘war on pollution’. Australia’s growing market in the country’s middle class also strongly relies on its image as a clean environment and producer. India, though still a huge consumer of Australian coal, has also revealed plans to become a‘renewable superpower’, expecting to invest $100 billion in to renewable energy within the next five years by doubling the ‘clean energy’ tax on coal to fund it. As the money starts to leave coal, new mineral opportunities present themselves in the graphite potential of the Eyre Peninsula. Major shifts in global investment are also proof that the world is moving away from traditional generation.Investment bank Citigroup released a report last year warning major utilities of ‘energy Darwinism’: as renewables reach cost parity with coal and gas generated energy, their market share will be swept from beneath them. According to investment bank UBS, it could be economically feasible for Australian homes to jump off the grid entirely by 2018, using only solar and battery storage. Coupled with recent large profile divestments from fossil energy by the Australian National University and, more significantly, $50 billion from a Rockefeller family owned foundation, public and private perceptions are changing. Traditional suppliers, such as Alinta Energy, are even investigating and investing in renewables. Their $2.3 million feasibility study in solar thermal generation looks like it will provide Port Augusta, with all of the regional town’s energy needs. According to the state government, South Australia passed the nation’s first dedicated climate change legislation and was the first state with a greenhouse gas reduction strategy. The results of that are obvious across the board, with a booming renewables industry, a stable supply of green energy and efficiency savings across the state. The City of Adelaide council recently announced it had cut carbon emissions by nearly 20% since 2007. Energy efficiency projects saved the council $406,000 in electricity bills in the past 12 months. “Rapid uptake of rooftop solar and over $5.5 billion of investment in wind farms have transformed South Australia’s electricity supply into a clean energy system. This ‘greening of the grid’ has reduced the carbon impact of South Australia’s electricity supply by 31% between 2004/05 and 2013/14,” a council report stated. South Australia could potentially be the first mainland state to go 100% renewables. While that figure might seem outlandish at first thought, there is modelling using actual demand, solar and wind data to suggest that renewables could supply all of the country’s energy with a stable supply – even without battery storage. By following South Australia’s early lead in its remarkable transition to clean renewable energy, taking advantage of the country’s abundant wind and solar potential, Australia could shift from being one of the biggest OECD polluters per capita to one of the lowest. Whatever happens, the share of renewables in the state will continue to grow. The investment that South Australia’s prime export markets – places like China and India – pour in to their own renewable projects will grow too. It seems obvious that as those markets develop, so will opportunities to create new industries and break new ground. This article was first published in The Lead – News Leads from South Australia – and is republished here with permission.